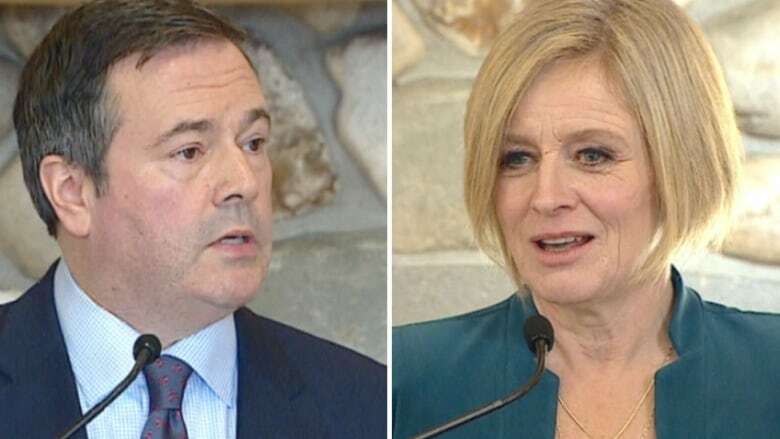 As Alberta's election window opens, Premier Rachel Notley and rival Jason Kenney hone their attack lines in duelling speeches and warn of dire consequences should the other side win. As Alberta's election window opens, Premier Rachel Notley and rival Jason Kenney honed their attack lines in duelling speeches Thursday and warned of dire consequences should the other side win. "The choice ahead is the starkest Albertans have faced in decades. A choice for how we build the future and a choice for whom that future is built," Notley told cheering supporters at a noontime NDP rally in Calgary. "Are we building a province for the many or the few?" Notley must by law hold the election sometime in March, April, or May, meaning she could drop the writ as early as Friday to launch a 28-day campaign ending March 1. That does not appear likely, given that all parties still have candidates to nominate. Notley has scheduled a throne speech to open the legislature on March 18. Notley, waving at the cheering crowds, said "I think we have a very big surprise in store for the pundits." While none of the parties have announced their election platforms, Notley has signalled she will run on her government's track record along with visions of the UCP laying waste to the economy. That government record, she noted Thursday, includes getting schools built, starting the Calgary Cancer Centre, advancing Calgary's rapid transit Green line, and delivering initiatives to diversify the economy and encourage more high tech while getting more oil refining done and pushing for a pipeline to tidewater. A UCP government, she warned, would see working people take a back seat to wealthy conservative insiders benefiting from sweetheart tax deals while proposed UCP spending freezes inflict deep and lasting harm to hospital patients and children in classrooms. "The choices that he (Jason Kenney) will make are too big of a risk for the people of Alberta," said Notley. Kenney, in recent speeches, has stated Alberta cannot economically withstand four more years of NDP management. He said Notley's government has not only failed to help Alberta's economy take flight, it has pinned its wings with ribbons of red tape and added taxes like the carbon levy. Despite low oil prices, Notley has resisted budget cuts and has instead ramped up spending on capital projects while funding to keep up with growth in health and education. The drawback has been multibillion-dollar deficits and debt levels now at just under $53 billion. Interest payments on that debt are now close to $2 billion a year. Kenney, speaking to municipal leaders in Cochrane, said that kind of deficit spending punishes not only this generation but the next. "These things are unsustainable," said Kenney. He said thousands of private sector jobs are gone, per capita GDP is down, the debt is over $50 billion, payrolls are down by about 10 per cent and the Canadian Federation of Independent Business recently gave Alberta an F grade on its red tape scale. A conventional oil well that takes a week to approve in Texas needs a year or more in Alberta, he said. "We can't seem to build things in this province," said Kenney. "We have too many people checking and not enough doing." Kenney's party will release its platform during the campaign but Kenny has already sketched out the broad strokes of the financial plank. The plan includes a ministry to work with business to reduce regulations by one third within four years. Kenney said streamlining regulations would help propel growth that would in turn allow any budget cuts to be modest and absorbed without affecting front-line services in health and education. Both Kenney and Notley have also promised to balance the budget in four years. Funding was a hot topic at the mayors' conference. Cochrane mayor Jeff Genung said the mid-size cities are looking for stability. "We've been mandated to instill a three-year budget, but we don't have that funding going past the next two years," Genung said. "We're just asking what we can budget on with our own people in mind, have the government pass that money down to the municipalities and let us build the projects and carry out the services that our communities are all asking for." The leader of the Alberta Liberals says funding for cities other than Calgary and Edmonton, hasn't always been a priority for previous governments but that would change under his leadership. "These mid-city mayors and their chief administrative officers are still waiting for stable, predictably funding," David Khan told CBC News. "We want to focus on treating them like adults, giving them the tools to plan their own budgets and provide the services to their citizens."